First of all thank you to all, you helped me a lot. So thank You Ismenio and Mike. The explanations from Mike around Reed Switch Corrosion are right. Fixing such problem is a step by step approach because some Reed Switch are not stable - they are just temporary working after a test with a good magnet. And changing the 64 reed switches is efficient but very expensive. So after some time and several replacements, it seems ok now but I will test it again and again each week during some time to be sure that it's stable. Thank you Arno Kreuzberg, Mychess and TerryG, These are common diodes 1N4148 but I used 1N914 as proposed by TerryG/Mychess and it works very well. To identify the faulty diodes, I used the multimeter test of TerryG and it helps a lot. Leds: Leds have often bad contacts. Moving them using a pen is usually enough to get them work again. Of course, it's better to use a soldering iron to make a better contact. I also had the control button problem described by Mike. But using a contact cleaner spray alone was not enough. I also used a small screwdriver to scratch the contact under the thin metal plate without unmounting the control button. Now it works very well. Now, I have 2 Conchess Monarch working. I will follow them carefully during some weeks to identify the remaining unstable reed switches. 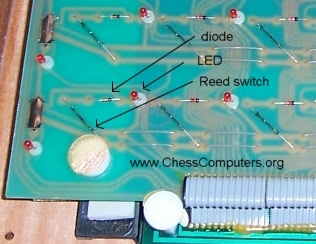 I agree with Mychess that the diode is most likely 1N914 / or 1N4148 common switching diode used on many applications to block reverse current to another part of the circuit. If you have a multimeter (digital, preferably) measure across one of the other diodes (they are usually oriented the same way, like on your photograph one end has a black band). Then measure your suspected diode, in one direction you will get about 600 - 900 ohms, when you reverse the meter leads there should be no measurement, not even on the highest scale(over Megohm). If you suspect a faulty diode then again measuring across a replacement and soldering it in place so that it is in the same orientation again. The replacement may not have the same colour bands but virtually any high speed switching diode will do the job. Note it will not be a zener diode as they are used for power regulation circuits and they are connected in a reverse direction, as they only conduct when the voltage approaches its breakdown value. It's a fairly simple job to replace diode or indeed LED or reed (usualy far easier than getting to it!! ), but if you are of a 'certain age' like me seeing up close can be a bit tricky without a magnifying glass. It's also a good idea to make sure if any other components need changing like LED's, as occasionally they can get a bit dull. This is probably switching diode type 1N4148 low current (JEDEC code yellow-brown-yellow-gray). May be replaced with a 1N914 diode. mean current : 150-200 mA. Price: 0.50 euro for 10 units , 3 euros for 100 units. Ok....I have taken a look at your circuit pic. for what thats worth. First here is a disclaimer... LOL... I cant fix or diagnose or even see for sure what your problem is so what I am about to tell you to do may be worthless !!! With that said I also want you to know that if you choose to do this you do it at your own risk and expense and I dont recommend you do it with out knowing for sure whats wrong or what part to use. Each square has a diode, a LED and a reed switch. It's a very simple electronic on the board. It should be a diode zener (If I remember well the comments from the electronic shop) - but I am not an expert. When the diode is out of order, you can see the following problem. I move one piece and several red leds of the area are switched on (instead of a single one). As it's not a reed switch problem and not a led problem and the electronic circuit looks nice, it can only be a diode problem. Sorry for the color code mistake. I came to an experienced people locally in an electronic store and he said me: the black line indicates that it's a diode and I can not read the reference (I thought it was a color code but I was wrong). So this experienced electronic expert said me: please try to find the reference. That's why I posted the question here. I will send a mail to Arno. Maybe he has some electronic schemas. The cause of the problem is not obvious. The game I got is probably coming from a repair shop. because there was here 8 different games - all out of orders. I just took 2 of them to be able to build one working (and I am not far now - I was able to play a game). But it's to bad not to try to repair the second one. I am currently repairing 2 conchess ambassadors. However, one of my Conchess has some reed switch and some leds and some diodes damaged. To find reed switch is quite easy and I already replaced them. But I am looking for the electronic reference of the diode. I took one to the electronic store but the reference is unreadable. Anybody has this information ? This is my main question. But as i also need to replace some leds, do you also have reference for leds ?